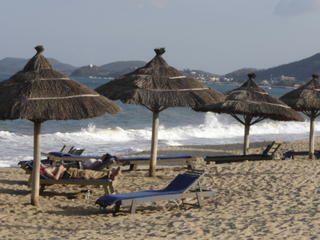 Nha Trang such a great place for nightlife, the beach and the weather. I love Sailing club whenever I go back my home town and go there for few beers or having dinner with friends. Everything is not so expensive and people are really friendly. They leave you alone on the beach and they give you a sweet greeting on the street. If you are an easy going person who doesn’t mind eating on the street or in a small restaurant then don’t forget to go to “Nem Ninh Hoa” spring roll restaurant on Le Loi Street. 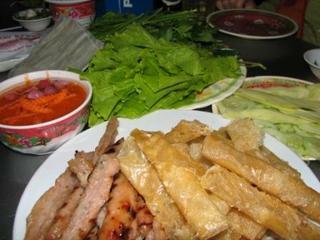 It serves crispy rice paper, pork and vegetables and rolling yourself with rice paper and dipping with a very special orange sauce with some sweet and spicy chilli. It’s delicious with an amazing price. You’d spend 2 dollars for 2 people for your lunch or dinner with 2 or 3 drinks. There is another small shop near the “Dam” Market where they sell great “Bun Ca” Fish noodle, where they use normal noodles which are long and round with steam fish, veggies and you’d order some more fried fish which makes you roll your eyes around and enjoy. It costs about 5 cents, meaning 7000 dongs per bowl. 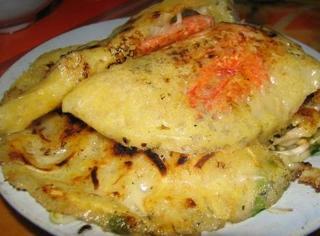 Steam rice pancake “Banh Xeo” and “Banh Can” are unbelievably good. They are steamed rice flower with shrimp, cuttlefish and small eggs, eaten with special fish sauce and veggies. Or some places cook it with pork but with the same stuff. At some other places they mix eggs with flower and cook but some places they don’t. Ask them in advance if you are a very strictly vegetarian fellow. Going down to the new part of Tran Phu street is the seafood restaurants area, you can ask people about Bien Tien restaurant which has really famous fried squid with butter and living king prawns or Lobster. You can choose whatever live fish are in the pool and they charge you with the reasonable price. Another very famous restaurant that you should check it out is “Gio” Wind restaurant, which has beautiful food for a reasonable price with very nice sea crab, located in the centre and right in front of the beach. If you are a big, adventurous person then go to the restaurant at No 6 Ngo Sy Lien with very good grilled squid and fish salad with Asian herbs. Most of these seafood places cost you about $15 or 200.000 dongs for your meal for 2. Don’t forget to try one day boat trip and enjoy your whole day between 4 different islands with a seafood lunch and drink horrible Vietnamese red wine with pineapple, smoke and swim around the floating bar with very crazy Vietnamese staff. Check it out with Mama Hanh’s Green Hat. You’d have such a great day and get pissed at the end of the tour with only 100.000 dongs or 6 bucks. Hope you guys who read my story enjoy your trip in my city with cheers and beers!!! 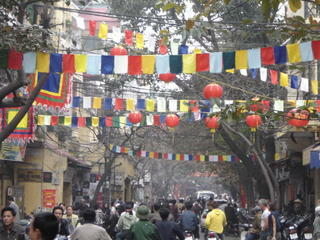 Tet in Hanoi is always cold and showery. 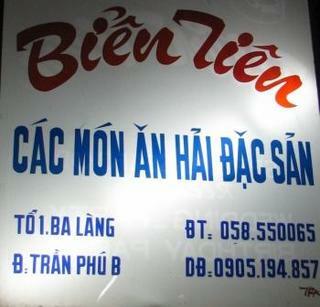 That’s the difference between Hanoi and the rest of Viet Nam. 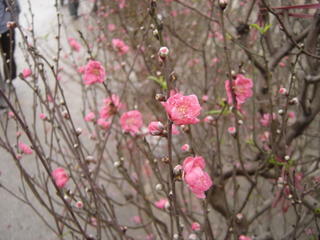 The weather’s so cold from Christmas to after Lunar New Year. It’s just about 9 degrees or under. People are still going out early in the morning ‘till midnight. Now is a good time for shopping, especially clothes and flowers but they are very expensive. You should wait till the last day of the lunar day (30th) so that the prices go down because they want to get rid of all the old fashioned clothes and half dead flowers. They don't bother to take their flowers back, it costs more than its worth paying for the transportation. Before Tet is a good time for those who love taking photos, photos about how Vietnamese people prepare for their special new year. You should go down to the Ngoc Ha village or Flower market called Nhat Tan where all the flowers are grown and sold. Florists go to the market at about 12Am, and I wonder when they finish their day? They might stay there or maybe they change people to stay and sell the flowers. Most of beautiful flowers are here and unbelievably cheap. 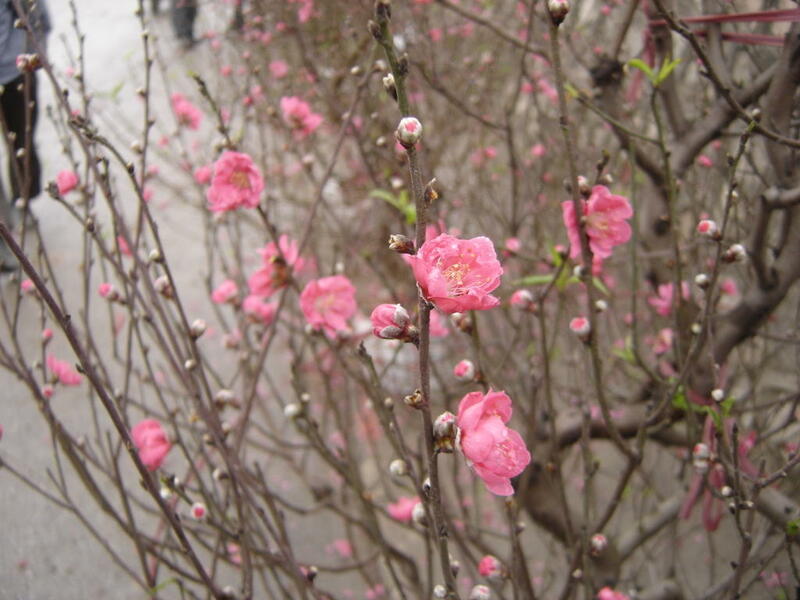 In Vietnam, Lunar New Year is very important. It is a traditional time of the year and also a chance for every body to meet their relatives, friends…. and of course parties. We prepare heaps of different foods and sweets, candies, beers and soft drinks for friends to come over and enjoy. Foreigners generally don’t like our traditional cakes but they’re very special and important for Vietnamese. They called Square cake-Banh Chung and Long cake-Banh Day are symbols of Land and God. The difference ways of celebrating Tet vary according to the 3 areas of Viet Nam. Most Hanoians spend their time with friends and family but in the south they spend only the first or maybe first 2 days at home with family and relatives. They spend the rest of the time going to other cities or to the beach for vacation. 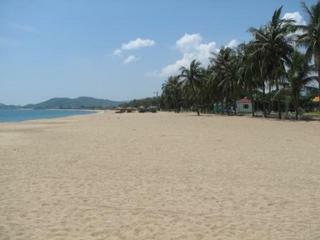 Nha Trang is their destination for most southern people. 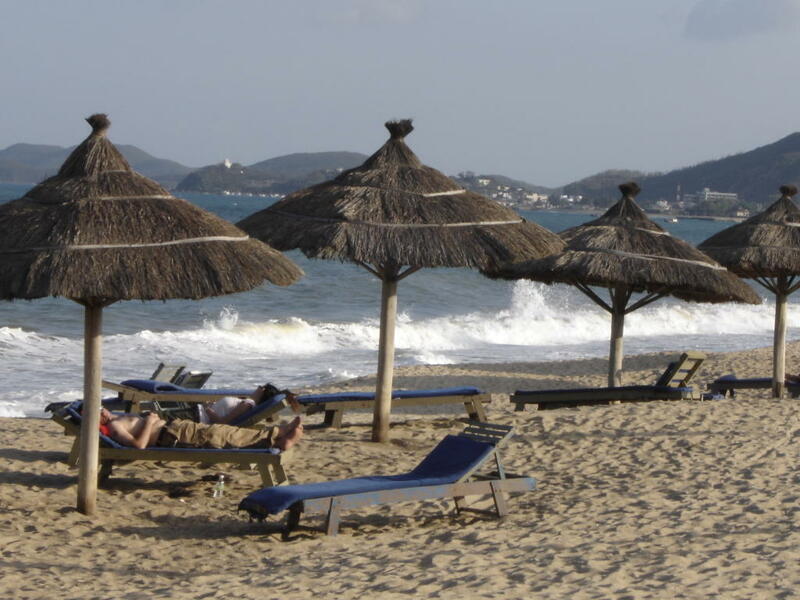 It’s no wonder it’s so crowded in Nha Trang in the Lunar New Year. My brother knew a priest and he wanted me to go to the Church to study the piano and listening to the priest Christian ideas. Yes, it was interesting and I was interested in for a while until my dad found out about me going there. He didn’t like the idea that we are a real communist family and not following any religion but I went there anyway. My father came to the church and chased me around with a branch he pulled off the tree out side the church try to hit me and force me to go home ignoring my explanation. Is that funny? I hope it won’t hurt my dad who passed away last 4 years ‘cause telling everybody about this. 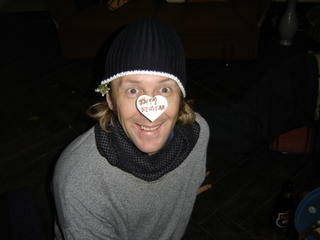 I also think he might be smiling in heaven knowing I am writing about this funny story, Thank god!! !